Not all of Larry’s creations responds to wind. 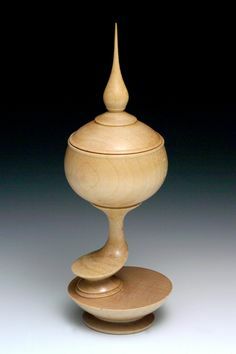 But for those that do, the shape of the copper and the balance of weight around all sides determine how easily they turn with a breath of wind. Larry makes thousands of leaves every year from sheets of copper that weigh a pound per square foot. The copper comes dearly – it retails for $11 per square foot – but Larry loves it for its earthy color and workability. After cutting out leaves with a band saw and sanding the edges, he takes them to the electric hammering machine he invented. He used to add texture by pounding his leaves with a handheld hammer, but his elbow joint eventually objected fiercely. Using pieces of various machines and even bungee cords, Larry made the machine pictured here. Larry Pryor adds texture to the thousands of copper leaves he makes each year. He invented this hammering machine to relieve stress on his elbow from repetitive hammering by hand. 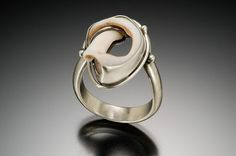 As Larry manipulates the copper under the hammer, he starts bending the edges to create a slightly cupped shape. Not only do the leaves look more natural with slight curves, but also they can catch breeze on the concave side and repel it on the convex side. Stacks of copper branches await their turn to be soldered onto a copper tube in the Sawtooth Wind Art workshop. 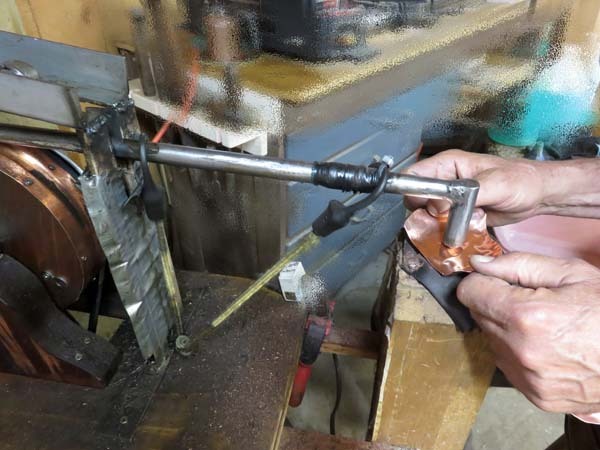 When a pile of leaves is ready, Larry begins to solder them onto #4 copper wire, almost 1/4″ in diameter. The wire becomes the tree branches. He purposely applies enough heat to the leaves to create a patina of gold and rainbow tones on the concave side of the leaf. He makes a stack of branches with one leaf at each end, another stack with two leaves at each end, then three and four. 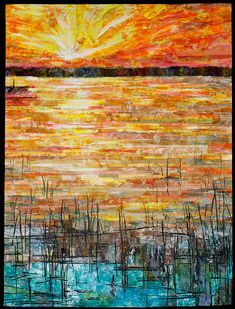 Always he’s working with the idea of balance on all sides of his wind art; the weight of one side must equal the weight of the opposite side. A heavy-duty stand on his work table holds a copper pipe that becomes a tree trunk. Each branch has a circle in the middle which fits over the pipe. Larry solders one branch to the pipe, then reaches for the next branch and solders that until the tree is the size he wants. 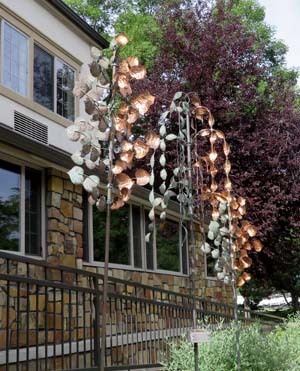 Stones stabilize the bottom of this copper tree that hangs from a hook at Sawtooth Wind Art’s outdoor gallery. 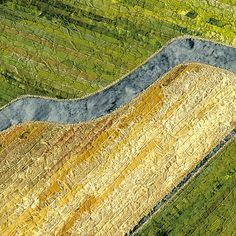 The two-toned effect that you see in the picture of a completed tree is created by encouraging oxidation on one side of the leaves and preventing it on the other. 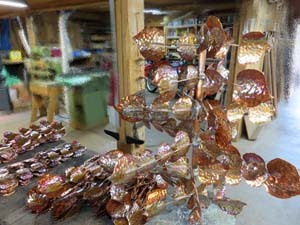 To preserve the copper color, Larry sprays the concave side of the leaves with acrylic before soldering them onto wire branches. On the convex side and on branches and trunk, he brushes a saltwater mixture that causes oxidation within days. Salt accounts for the classic blue-green color, Larry told me; without it, oxidation makes copper turn brown. Finally the tree is ready to mount on a steel pole. A ball bearing at the top of the tree between the copper and the steel will allow the tree to rotate, provided the steel pole is absolutely straight. For that reason, Larry delivers and installs his trees for customers from Laramie to Denver. For customers who are farther away, he suggests the hanging variety. The tree in the photo above hangs from a hook, while the weight of two stones hanging from the bottom steadies it in the wind. 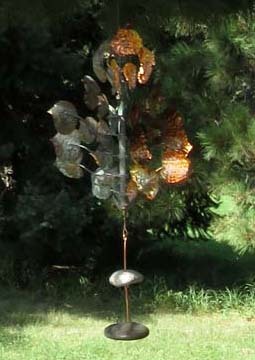 Larry uses the same concept to mount some of his geometric wind sculptures. He discovered that he could curve a steel rod with his tractor tire to create a graceful structure on which to mount a hook. It’s strong enough to hold his art and the stones that weight it. This waterwheel made of stone and copper by Larry Pryor catches water in one paddle at a time, turns a few degrees, and releases the water into the metal pot below. 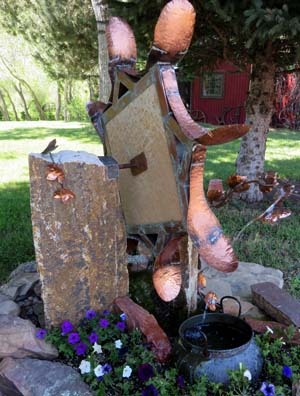 A focal point of Larry’s outdoor gallery is his stone and copper waterwheel. The stone that forms the bulk of it weighs about 150 pounds, but just an ounce of water in one of its copper paddles makes it turn. 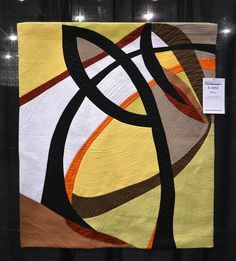 Like his wind art, balance is the key, Larry told me. While I was visiting he had another waterwheel in progress. About the size of the one pictured here, it was mounted the same way between two heavy beams. Larry used his hand to start it turning slowly and pointed to the area closest to the ground when it stopped. “The stone is heavier there,” he noted. Because a stone consists of different minerals, every cubic inch doesn’t weigh the same as every other cubic inch, Larry explained. He knew he would have to add additional weight to the part of the wheel that had come to rest at the top of it. Extra copper wire and solder would do the trick. 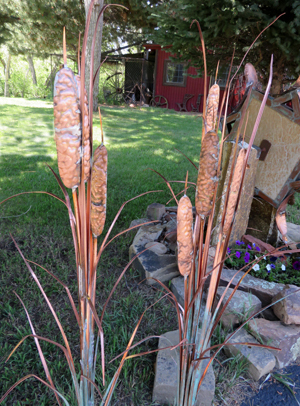 Copper cattails made by Larry Pryor are stationary sculptures among the kinetic wind art in his outdoor gallery. You can drop by Sawtooth Wind Art’s outdoor gallery any day or time of the year. There you can see the full range of Larry’s metal art, including copper cattails mounted across the length of the wall of his workshop. Larry asks that you let him know you are coming; a map and the phone number are on Sawtooth Wind Art’s website. 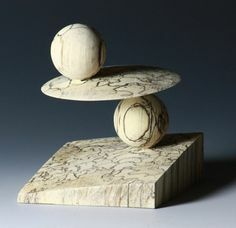 While you’re on the website, visit the video gallery for a preview of his kinetic sculptures. For many years the principal business of Larry’s workshop was woodworking — the source of the name Sawtooth. After the economic downturn of 2008, many of the contractors in high-end construction who provided Larry with work went out of business. On the other hand, there was more interest in his copper art, which he had been creating since the 1990’s. Three years ago he converted the workshop fully to copper art production. Larry seems to have no regrets. 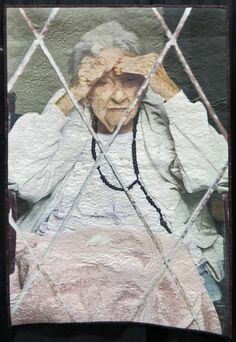 Observing the joy with which people purchase art warms his heart.